SHARJAH, April 15  India will, for a change, meet Pakistan on equal terms when they clash in the final of the three-nation Coca Cola Cup Cricket Tournament here tomorrow. ST. GEORGE'S (Grenada), April 15  Darren Lehmann hit an unbeaten 110 off just 92 balls and fellow left-hander Michael Bevan had a run-a-ball 72 not out to set up Australia's a 46-run victory over the West Indies. The victory yesterday at the new Queen's Park Stadium levelled the seven-match international cricket series at 1-1. SHARJAH, April 15  Pakistan skipper Wasim Akram and coach Javed Miandad have dismissed allegations about match-fixing aired by former captain Rashid Latif after the side lost to England in the Coca Cola Cup cricket series here on Monday. NEW DELHI, April 15  Mahesh Bhupathi stunned second seed Vladimir Voltchkov of Belarus in straight sets to storm into the semifinals while top seed Leander Paes once again was stretched before making the grade in the Servo Indian Oil Tennis Tournament here today. DOS HERMANAS, April 15  With each of the five games ending in a draw, the positions remained undisturbed in the Dos Hermanas Super GM Chess Tournament here last night. CALCUTTA, April 15  Punjab and Sind Bank warded off a late resurgence to quell Army Services Corps 3-2 and lift the Beighton Cup for the first time here today. SHARJAH, April 15 (UNI)  India will, for a change, meet Pakistan on equal terms when they clash in the final of the three-nation Coca Cola Cup Cricket Tournament here tomorrow. A little over a week ago, India had started the tournament from a position of disadvantage after losses to Pakistan in the recent series at home. To add to that, they started their campaign here in a disastrous fashion, suffering a humiliating 116-run defeat to Pakistan in their opening league engagement. But since then, they have come up with three victories in a row - two against England and one against Pakistan - to top the league and emerge strong contenders for the title. Like India, Pakistan are also a determined lot and would not like to upset their World Cup preparations with another defeat. While Indias wins here have rejuvenated the team, Pakistans two defeats to England and India have come as a wake-up call for them, just in case they had dropped their guard. The stage is, thus, set for yet another nail-biting, nerve-racking battle of wits between the two traditional rivals. Pakistan have a 16-5 record against India at this desert venue, but the Indians are a transformed lot this time. The fact that they drubbed Pakistan on Tuesday batting second has also helped to raise the Indians confidence levels. All others won their matches after making first use of the pitch. The victory against Pakistan was their first after eight straight defeats, starting with the Sahara Cup in Toronto last year, and they would like to maintain the winning trend for some time. Pakistan must have done a lot of soul-searching after suffering two consecutive defeats to England and India. The Indians also realise that they need, more than anything else, to stay focussed. The Indians main worry has been their batting. Except for the last match against Pakistan, their batsmen have never seemed in command here, and even in that engagement they did cause some worry by the manner in which they suddenly lost three quick wickets. "I was a little disappointed...We could have won that match by nine wickets", coach Anshuman Gaekwad said. Skipper Mohammed Azharuddin, who hurt his toe while batting against England last Friday, remains a doubtful starter for the final. The team is due to go to the nets for a long practice session, when a final decision about Azharuddins fitness would be taken, Gaekwad said. Vice-captain Ajay Jadeja led the side during Englands innings in that match and in the two encounters that followed, and India ended up winning all three. If Azharuddin is unable to play tomorrow, Jadeja will have the honour of leading the team yet again. Opener Saurav Ganguly and medium-pacer Javagal Srinath, who missed the last match because of slight injuries, are fully fit, Gaekwad said. Ganguly has not been able to get going here so far and will need to summon all his powers of concentration to give India a decent start. Sadgopan Ramesh, the other opener, is gaining in confidence, with half-centuries to show for it. His 82 against Pakistan on Tuesday is highest in one-day cricket and he will be hoping to continue in the same vein. Rahul Dravid has also been going from strength to strength in recent times. In the last match against Pakistan, he dictated terms to the bowlers with a brilliant 81. But the other batsmen in the side, including Jadeja, Kambli and Robin Singh, will have to get their act together. The Indian bowling in the tournament so far has been a revelation and they have more than made up for the batsmens shortcomings. Medium-pacer Venkatesh Prasad has been the most impressive of the Indian bowlers, providing the side with vital breakthroughs. He and Srinath are a formidable combination and they will definitely test the Pakistani batsmen. The spinners, Anil Kumble and Sunil Joshi, have also done well. They have been mean, crafty and effective. With the wickets here getting slower with each succeeding match, the spinners have certainly added teeth to the Indian bowling. The Indian fielding has improved by a few notches and the team has risen to the occasion in the last three games. Pakistan will be hoping to stay on the winning track and they have the players who match the best. Their bowling is consistent, with Wasim Akram, Shoaib Akhtar, Saqlain Mushtaq and Azhar Mahmood giving off their best here. But the same cannot be said of their batsmen. In fact, the suicidal tendencies of some of their batsmen have been a major factor in Pakistans poor show in their last two matches. Openers Saeed Anwar and Shahid Afridi have not exactly provided the fiery start they usually come up with and that has added to the pressure on the middle order. Ijaz Ahmed and Inzamum-ul-Haq have struck hundreds in this competition and they look in good nick. Similarly, Yousuf Youhana has done well. Salim Malik has consistently delivered, falling back on his wealth of experience at times of crises. Moin Khan has shown that he has enough guts and gumption to come with a useful knock under pressure. Pakistan clearly have a game on their hands tomorrow. The Indians are on a high and Pakistan will have to lift their game in all departments to match them in the final. The setting could not have been better for another title bout between the arch rivals. The teams: India: (from) Mohammed Azharuddin (captain), Sadgopan Ramesh, Saurav Ganguly, Rahul Dravid, Ajay Jadeja, Amay Khurasia, Robin Singh, Nayan Mongia, Vinod Kambli, Sunil Joshi, Ajit Agarkar, Javagal Srinath, Venkatesh Prasad, Anil Kumble and Nikhil Chopra. Pakistan: (from) Wasim Akram (captain), Shahid Afridi, Saeed Anwar, Ijaz Ahmed, Inzamum-ul-Haq, Moin Khan, Azhar Mahmood, Saqlain Mushtaq, Wajahatullah Wasti, Yousuf Youhana, Abdul Razzak, Arshad Khan, Shoaib Akhtar and Salim Malik. The match will begin at 1100 GMT (4.30 p.m. IST). ST. GEORGE'S (Grenada), April 15 (AP)  Darren Lehmann hit an unbeaten 110 off just 92 balls and fellow left-hander Michael Bevan had a run-a-ball 72 not out to set up Australia's a 46-run victory over the West Indies. The victory yesterday at the new Queen's Park Stadium levelled the seven-match international cricket series at 1-1. Lehmann and Bevan added a record unbroken 172 for the fifth wicket off just 147 balls, pushing Australia to 288 for four off 50 overs, its highest ever total against the West Indies. The West Indies lost wickets at frequent intervals and were bowled out for 242 from 47.3 overs. Opener Sherwin Campbell was the leader for the second match in a row, striking 46 from 77 balls. Leg-spinner Shane Warne was the best of the Australian bowlers with three for 39 from 10 overs. Lehmann and Bevan dominated the second half of the innings after Australia slipped to 116 for four in the 26th over after choosing to bat first. The pair batted sensibly picking singles and two's before accelerating towards the end. The last 10 overs saw 91 runs. The partnership was the highest for the fifth wicket for Australia against all countries and the best for any wicket against the West Indies. 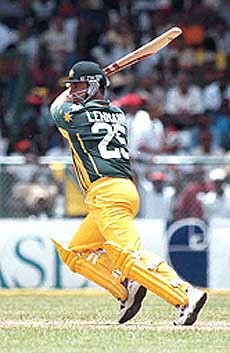 South Australian Lehmann's second and highest one-day international century included 10 boundaries across a lightning-quick outfield and one big six over midwicket off Carl Hooper's off-spin. Lehmann brought up his half century off 48 balls with five fours. Bevan took 53 deliveries for his 50, striking four fours. Hooper took two for 66 off 10 overs, while King grabbed two for 53 off 10 overs. Fast bowler Curtly Ambrose was the most economical of the bowlers, conceding 47 runs from his 10 overs. The West Indies reply was stalled early as fast bowler Damien Fleming removed dangerous left-handers Shivnarine Chanderpaul and captain Brian Lara cheaply. Chanderpaul was brilliantly caught left-handed at backward point by a diving Shane Lee while Lara dragged on all ill-advised pull, leaving the home team at 18 for two. Campbell and Jimmy Adams rebuilt the innings in a busy stand of 84. But after both batsmen fell quickly the West Indies never threatened again. Adams was bowled by Warne after cracking five fours in 40 off 56 balls, Campbell was also bowled. Only Phil Simmons robust 39 off 40 balls and a consolation last wicket stand of 27 between Curtly Ambrose and Reon King gave the 15,000 capacity crowd anything more to cheer about. Lee, who ended the match with a direct hit run out of Ambrose, grabbed two for 22 off six overs. Total: (for four wickets 50 overs) 288 Fall of wickets: 1-30, 2-85, 3-108, 4-116. Bowling: Ambrose 10-0-47-0, King 10-0-53-2, Hooper 10-0-66-2, Arthurton 8-0-43-0, Bryan 7-0-41-0, Simmons 5-0-32-0. Fall of wickets: 1-3,2-18,3-102, 4-125, 5-135, 6-140, 7-174, 8-183, 9-215. Bowling: Fleming 8-1-45-2, Reiffel 8-0-53-1, Julian 7-0-49-0, Martyn 2-0-5-0, Warne 10-2-39-3, M. Waugh 3-0-13-0, Lee 6-0-22-2, S. Waugh 3.3-0-13-1. NEW DELHI, April 15 (PTI)  Mahesh Bhupathi stunned second seed Vladimir Voltchkov of Belarus in straight sets to storm into the semifinals while top seed Leander Paes once again was stretched before making the grade in the Servo Indian Oil Tennis Tournament here today. The 23-year-old Bhupathi played crafty tennis to deny the 135-ranked Voltchkov the pace to feed off before pulling off a fluent 6-3, 6-3 triumph at the centre court of the Delhi Lawn Tennis Association complex. Top seed Leander Paes, however, had to overcome a mid-match slump and unforced errors at crucial moments before quelling the challenge of South Africas unseeded Jeff Coetzee 6-4, 4-6, 6-2 in a match lasting around two hours. Paes will meet Gregory Carraz (Fra), who upset sixth seed Oleg Ogorodov (UZB) 3-6, 6-1, 6-4 while Bhupathi plays third seed Gaston Eltis (Arg) who warded off the challenge of unranked Andreas Vinciguerra (Swe) at 3-6, 6-2, 6-2. Bhupathi, modestly ranked at 318, used excellent court craft which he later attributed to his top-level doubles play to trouble the tall Voltchkov, who created a major flutter at the Chennai Open by taking a set off world number two Carlos Moya of Spain in the opening round. The unseeded Indian fought off two breakpoints in the third game of the first set before breaking the increasingly error-prone Voltchkov in the eighth game to pocket the set. He kept up the momentum into the second set and dominated the rapidly fading Belarussian, whom he beat in last years Wimbledon qualifiers, with two successive breaks at the end. "I dont think he played too well. I played smart. I used the wind and kept the ball high and deep," said Bhupathi, who was pleased with this particular victory as it would guarantee a place in the French Open qualifying rounds. Voltchkov had Bhupathi in trouble early on when he held two breakpoints in the very third game. But Bhupathi, who attributed his sharp angled groundstrokes and pleasing volleys to being the world number two doubles pair with Paes, fired an ace to force deuce before winning the game with a big serve. "I have matured a lot playing high level doubles. But I never expected him to play this poorly. But I noticed he likes to play off the pace of the opponents shots and so I did not give them that," Bhupathi said. The strong winds that swept across the centre court seemed to unsettle Voltchkov who struggled to hold his serve as his deep whipping forehand shots to either flanks became rare. Bhupathi clinched the vital break in the eighth game by converting his third breakpoint when Voltchkov hit a return long and then served out for the set. In the second, Voltchkov briefly came on top to break his opponent, but Bhupathi came back strongly to break back before holding serve to make it 2-all. He needed courtside attention of the doctor as he felt giddy due to the heat. The game went on serve till the tenth, when Paes serving to make it 5-all, suddenly lapsed into mistakes. He squandered two game points by netting easy drop shots. Jeff Coetzee played fine approach shots deep to either flanks which unsettled Paes, who conceded the setpoint when he netted an easy drop and then buried a forehand return into the net. But Paes, whose ranking stands to 108 against Coetzees 252, held the edge in the scrappy decider. After trading breaks in the third and fourth games, Paes broke his opponent to go up 3-2 by hustling at the net. He immediately lifted his game, holding serve to go up 4-2 before clinching the break with a couple of good rallies and a perfect lob on the first of two breakpoints. He then served out, Coetzee netting an easy return to end the battle. The 178-ranked Ogorodov, expected to meet Paes in the semifinals, looked on his way when he pocketed the first set 6-3, but then lapsed into errors as the 211-ranked Carraz produced the upset in an outside court. Third-seed Gaston Eltis (141) also looked in trouble when he lost the first set 3-6, but the Argentinian bounced back with vigour to down Vinciguerra, the talented Swedish Southpaw. Leander Paes (s1) b Jeff Coetzee (SA) 6-4, 4-6, 6-2; Gregory Carraz (Fra) b Oleg Ogorodov (Uzb s6) 3-6, 6-1, 6-4; Mahesh Bhupathi bt Vladimir Voltchkov (Blr s2) 6-3, 6-3; Gaston Eltis (Arg s3) b Andreas Vinciguerra (Swe) 3-6, 6-2, 6-2. SHARJAH, April 15 (UNI)  Pakistan skipper Wasim Akram and coach Javed Miandad have dismissed allegations about match-fixing aired by former captain Rashid Latif after the side lost to England in the Coca Cola Cup cricket series here on Monday. Pakistan, who had already made it to the final of the tournament, went down to England by 62 runs in their penultimate league match. Since then, they have also lost to India by six wickets in their last league engagement. The two sides will meet in the final tomorrow. Reports from Karachi had quoted Latif as saying that he suspected the match against England had been fixed. "These guys are once again trying to make fools of the public. The way they lost the match, it is obvious something fishy has again started in the team," he was quoted as telling a news agency. Latif also suggested that opener Saeed Anwar had missed a match against Sri Lanka in India and against England here because he may not have wanted to be part of match-fixing. The former Pakistani wicket-keeper is one of the witnesses in the inquiry being conducted by a judge into the betting and match-fixing charges in Pakistan. "It seems that we have to win every game we play to keep the allegations at bay," Akram was quoted as saying in the Dubai-based Khaleej Times today . "It is absolutely disappointing to hear one of those things again. We won every game in the recent past but still have to do some explanations just because one man who is not even in the team says something which suits him from thousands of miles away. It's pathetic," he said. Akram said his side had fought till the last ball even in the games it had lost. "The opposition played better and they won, it is as simple as that. I tried everything I had to win both the games (against England and India) but they just did not go our way," he said. When India were losing, nobody said that they had fixed the matches. It's becoming a little too much," he said. Anwar said the allegations by Latif were "rubbish and absolutely false." "I sat out of the game against Sri Lanka because I had irritation in my eyes and against England and I was not able to run because of a stiff back. That's all. I have no further comments to make on this subject," the newspaper quoted Anwar as saying. Miandad said Latif's remarks were "unfortunate but nothing new for us now." "We are trying to win every game we play and most of them we are wininng. How come he knows what is going on here in Sharjah? This is absolutely pathetic and should end now," he said. "I am happy with the way the team is playing and all the boys are woking very hard to win every game they play," he added. CALCUTTA, April 15 (PTI)  Punjab and Sind Bank (PSB) warded off a late resurgence to quell Army Services Corps (ASC) 3-2 and lift the Beighton Cup for the first time here today. Hard-working Bhupinder Singh struck the all-important goal in the 57th minute of the contest at the Mohun Bagan ground after both the teams were locked 2-2 at the interval in a fast-paced encounter. PSB, making their maiden entry into the final of the more than century-old hockey tournament, shot into the lead as early as the third minute of the contest when defender Sharanjit Singh converted a penalty corner. But ASC, who had won the title three times, equalised the score two minutes later with Bhusan Lakra finding the target after dribbling past the defence with deft stickwork. Relying on a series of speedy counter attacks, PSB took the lead again in the 28th minute, Parminder Singh producing a superb field goal following a gentle pass near the box by Sanjeev Kumar. Undaunted by the second goal, ASC toned up their game and managed to restore parity again just at the stroke of half time with Ajay Lakra finding the target following a penalty corner. Both the teams played their hearts out in the second session but the bankmen tilted the scale in their favour by scoring the match winner through Bhupinder Singh. The match-winning goal triggered off protests from the ASC players who argued with umpire D.S. Claudius claiming that the ball was not stopped cleanly following the penalty corner. The summit showdown between the two Jalandhar outfits saw some good moves, but both the teams failed to provide the finishing touches inside the box on a number of occasions. PSB, who dominated the proceedings in the second session, could have won by a bigger margin had their forwards not muffed a couple of easy scoring opportunities. Rajinder Singh, who played well for PSB today, was guilty of squandering as easy opportunity as he hit the ball straight to ASC custodian A.R. Peter from close range. Apart from clinching the cup, PSB were also richer by Rs 1 lakh for winning the title while ASC had to be content with Rs 50,000. DOS HERMANAS, April 15 (PTI)  With each of the five games ending in a draw, the positions remained undisturbed in the Dos Hermanas Super GM Chess Tournament here last night. This was the second time in this event that all five games in a single round ended in draws. Michael Adams of England kept his half point lead over Vladimir Kramnik intact and could well win the title as the tournament comes to an end on Sunday. Adams drew with white pieces against Veselin Topalov of Bulgaria. Adams now has five points and there are two more rounds to go. Adams is scheduled to play Kramnik in the next round and this could well decide the title, as Kramnik is only half a point behind. In the final round, Adam meets Anatoly Karpov and that ninth round match will be held today itself before the eight- round, because Karpov is scheduled to go to Paris for the Disneyland Chess inauguration. Anand and Korchnoi were engaged ia draw which lasted 29 moves, the most interesting game of the day. Korchnoi had in his mind his horrible loss to Anand at the Tilburg tournament last year. This time the game was French defence maccutheon-variation. Adams with white went in for the closed Sicilian. He got nothing special out of the opening but still had an advantage. Topalov held on for a draw and Adams was content with it as it kept him in lead. Judit Polgar, who had lost four of her six previous games showed great defensive skill to hold Kramnik, who had white. Kramnik attempted to win through positional play, but Polgar managed to draw. The Karpov-Gelfand game was a Catalan where Karpov sacrificed a pawn for central play. But Gelfand found some compensation and drawing was not difficult. In another game Svidler and Illescas were engaged in a draw from a Sicilian. For Illescas this was again a good result as he is way down in ELO ratings as compared to the company. Points after 7 rounds: 1. Adams (Eng) 5; 2. Kramnik (RUS) 4.5; 3-5. Illescas (ESP) Gelfand (BLR) and Topalov (BUL) 4; 6. Karpov (RUS) 3.5; 7. Korchnoi (SUI) 3; 8-9. Svidler (RUS) and Anand (IND) 2.5; 10. Polgar (HUN) 2.